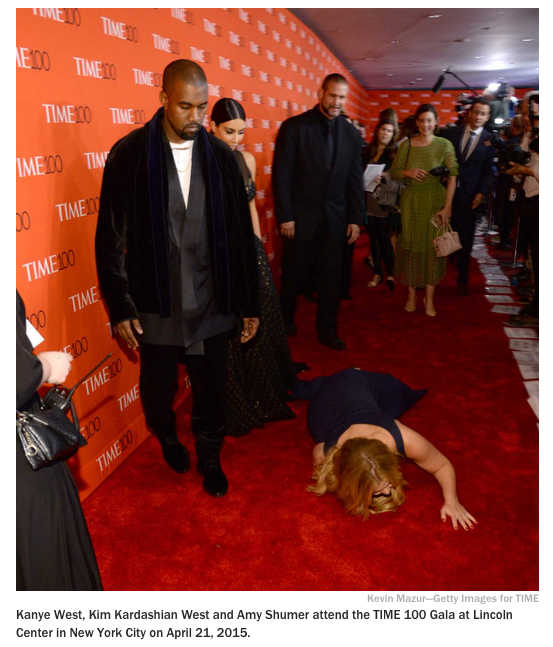 If you have a newsfeed of any kind, you’ve probably seen headlines about comedian Amy Schumer falling down in front of Kayne West and Kim Kardashian at Time’s 100’s Gala. After seemingly face-planting in front of the press, Schumer stood up and feigned embarrassment while the unamused – and rather unconcerned – couple walked on. Meanwhile the world photographed the whole moment. Now, here’s what makes this a brilliant stunt (versus stunts like Kayne’s award show behavior), no one was hurt and the joke is the joke itself. After all, Kayne and Kim are well-known for publicity stunts themselves, including stealing other people’s spotlights). So, to pull your own publicity stunt in which you hijack their celebrity with your comedy – well, that’s going to get everyone talking. When I was with Fletcher Martin, we did something like this for Arby’s when we placed branded thought bubbles in front of billboards around town so the people on the billboard’s appeared to be “Thinking Arby’s.” Drivers called into local radio to laugh about it. Blogs and national media covered it. People liked the prank of it. Even, the owners of the billboards didn’t mind because it brought attention to their brands in a funny way. Brands that can make fun of themselves or are willing to prank their customers or even their competitors; brands that can make people laugh create the kind of personal connections that foster real loyalty.